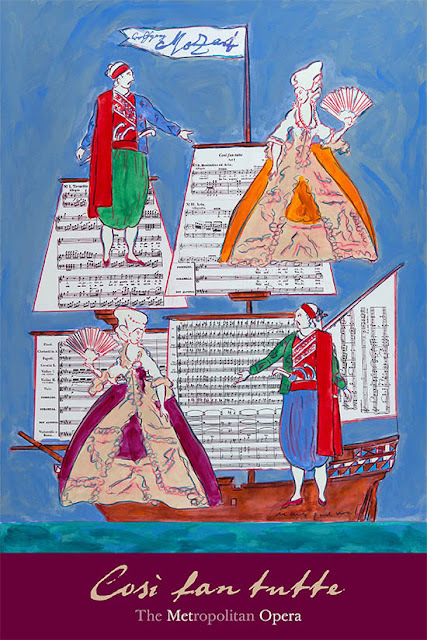 Mark Podwal’s most recent work for New York’s Metropolitan Opera, Mozart’s “Cosi fan tutte” (36″ x 24″) giclee print is available in an edition of 150 signed and numbered archival pigment prints. Other Mozart prints by Podwal are also available here. Mozart's librettist for this opera, as well as his most famous other operas, was Lorenzo Da Ponte who was born Jewish. However, his father later converted his family to remarry. He later moved to the USA. Czech TV is producing a documentary film about Mark Podwal's preparations for his 2014 Terezin Ghetto Museum exhibition. An earlier film, “My Synagogue is in Prague,” can be seen here. Mark Podwal's work is represented in the collections of the Metropolitan Museum of Art and the Victoria and Albert Museum, among many others. He has received awards from the Society of Illustrators and the Society of Newspaper Design, and the French government named him an officer of the Order of Arts and Letters.